All five 2019 editions of our well-received Netherlands chart atlases are available now. Covering the entire Netherlands coast, their useful A2, wire bound format has proven popular and we are now offering free digital charts for the whole country with each atlas, for download onto our Imray Navigator app for Android and Apple devices. Based on the latest data from the Netherlands Hydrographic Office, the atlases include all of the charts plus tidal and navigation information for passage and approach. Their carefully edited format makes them first choice for yachts sailing the area, with Imray's highly-regarded large scale harbour plans as standard. Coverage along the North Sea coast, from the Belgian-French border, through the Zeeland, South Holland and North Holland coasts up to and including Den Helder. Includes all of the navigational charts and tidal data required for coastal passage and approach, plus a larger-format passage planning sheet for plotting routes across the North Sea. This includes high quality coverage of this notoriously difficult-to-navigate area. Includes Westerschelde, Kanaal Gent-Terneuzen, Oosterschelde, Veerse Meer, Zoommeer, plus canal links and North Sea coastal approaches. This atlas includes extensive coverage of Nieuwe Waterweg, Nieuwe- and Oude Maas, Brielse Meer, Spui, Noord, Dortsche Kil, Hollandsch Diep, Haringvliet, Volkerak and Grevelingenmeer. Plus approach charts for the Maas and Haringvliet entrances, and detail of the standing mast routes between Rotterdam and Amsterdam. 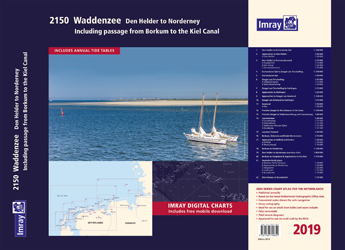 The 2019 edition of this atlas has been extended to include passages to the entrance to the Kiel Canal. Updated colours mean easy navigation of shallow areas within the Waddenzee, as well as the North Sea coast and coastal islands. Included are all of the navigational charts and tidal data required for passage and approach. Includes extensive coverage of the IJsselmeer, Markermeer and Randmeren, as well as the Nordzeekanaal from IJmuiden to Amsterdam.